Time to close out the year with another classic remaking. Back in 1983, I decided to try my hand at recreating Nintendos fan favorite: Donkey Kong. My version, cryptically called Monkey Maze, is Decembers Program of the Month. 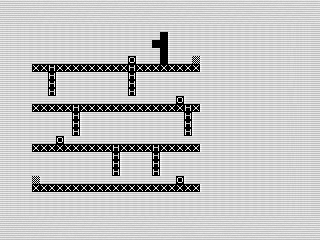 Not quite as complex as the original, my version has only a single board that you can navigate around using the ZX81 cursor keys (5, 6, 7 and 8 which map to left, down, up and right). It plays pretty well. Go give it a try, and avoid the barrels, if you can.